The subject of Stem Cell Transplant stirs strong emotions. For some with acute forms of MPN it represents a last best option. For others, it’s a dreaded procedure down the road. And for still others it is the choice to make a fresh start and live life freed of blood cancer. There is a reasoned ground to walk in thinking about SCT. Listening to patients who’ve been there, are there. Listening to physicians, to parents and caregivers entrusted with oversight of the SCT patient. In this series MPNforum is opening a dialog that will continue to be informed by new scientific developments, new triumphs and setbacks. It is a first step in approaching a procedure we may elect down the road. 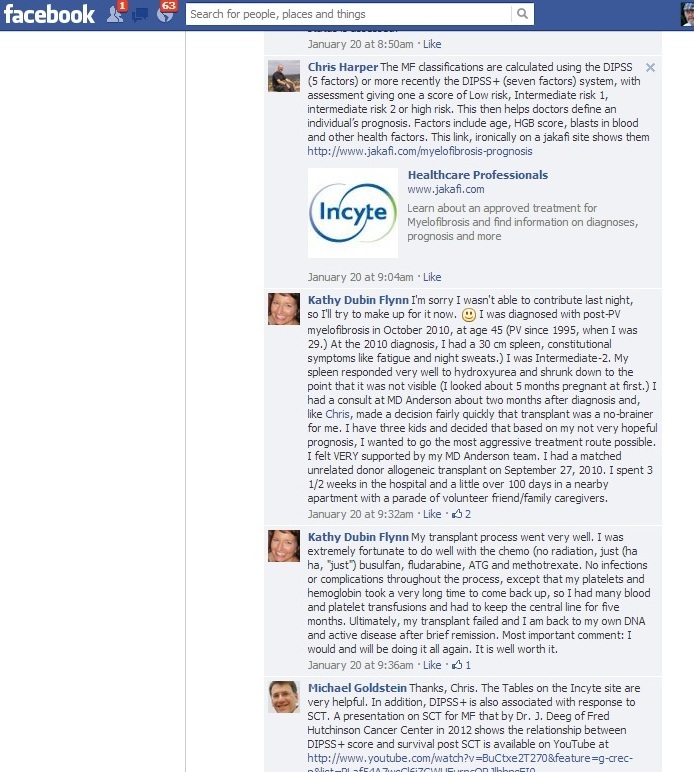 Here is a free form on-line conversation, a meeting of MPNforum patients on its Facebook page. This is a slightly edited and truncated version of the actual meeting that extended across parts of three days and took more than four hours. Dr. Michael Goldstein moderated. Genny, a young mother whose steps through the process have been chronicled over the past year in MPNforum; and her mother, Ann Haehn, who has been both her primary caregiver and her chronicler. She is also the founding head of a non-profit devoted to finding donors for prospective stem cell transplants. Included too is a brief biological look below the surface. The lead off video is a view from Dr. Sonali Smith of the American Society of Clinical Oncologists presenting the stages of stem cell transplant. Michael Goldstein Because of great interest among members of our MPN Community, the editors of MPNforum asked me to moderate a discussion on our Facebook page about the Hematopoietic Stem Cell Transplants (SCTs) for Myelofibrosis (MF). So, welcome to our discussion! A little about me for starters. I am an internist and psychiatrist and have spent a good part of my career helping clinicians to use effective clinician-patient communication skills, including skills for educating and empowering patients and partnering with patients to make treatment decisions. I have had polycythemia vera for the last 7 year and have been doing well on interferon, with no evidence of MF. I am certainly NOT an expert on MPNs or their treatment. In the best of circumstances, SCT produces a “cure” for MF, and for those with advanced MF, the procedure can be lifesaving. However, SCT has both acute and long-term risks that include death and chronic debilitating illness. To summarize, the decision about whether to undergo SCT is a complicated one that requires weighing of benefits and risks of SCT for each individual . The decision to undergo SCT for MF is not an easy one and a good decision requires careful consideration of all the specific elements relevant to your condition and history. Collaborating with your treatment team is a necessary step. Jeremy Smith So tonight we would like to discuss SCT’s the Good The Bad and The Ugly as there are of course many sides to this process. Some call it a cure but is it really? Jeremy Smith Does anyone have questions or comments? Patsy Bushee I am 64 as of last September, and I had a SCT at age 63 in April, 2012. I have done extremely well, and I am showing to be cancer free. I still deal with being tired, some joint and bone pain, but really am doing well. My transplant was done in Augusta, GA by a Dr. Kota, who had worked at MD Anderson. My sister, age 58 at the time was my donor. I have been blessed. Marty Prager I had an SCT for MF 3 years ago. I have made a good recovery with only a few incidents of chronic GVH. I am also a member of an integrated health care provider (insurance and health care by the same company [Kaiser]). Dr Goldstein: What is your advice to encourage physicians in different disciplines communicate more with the BMT specialist as GVH can affect multiple organs? Marty Prager My match was 10/10 from an unrelated donor. Jeremy Smith Patsy and Marty at one point in your disease progression did your Doctors decide it was time to move away from medicine and to an SCT? (Anonymous): How important is the match from an unrelated donpr..9/10, 10/10..do you have better odds of the transplant working? Jeremy Smith I have been told by my Doctors and the Stanford Bone marrow Clinic that your chance for success with a 10/10 doubles. Jeremy Smith At what point is it time to make the move to SCT? Marty Prager I was a difficult match and when a new donor joined the donor pool with such an incredible match, the path was very clear. My initial retiscence in 2006 was the lack of a good enough match and the fact that I was not transfusion dependent. A better match *generally* means fewer GVH issues. Jeremy Smith Marty were you ever transfusion dependent? Marty Prager I was transfusion dependent prior to TX (transplant). 1 to 2 units every 3 weeks. Patsy Bushee Things have improved to the point that an unrelated donor does just as well as a sibling donor, or so I am told by my doctor. A child is never a good match, and you do want 10 out of 10. I have an advantage because of the fact that my doctor in Columbia, SC use to do the transplants, but no one does tjem now here. Therefore, I see my doctor here, and my doctor in GA. Not everyone has major GVHD. I have had only slight problems, and almost none now. I am now day 277. I am almost back to normal living. Still in home isolation because of the flu that is heavy in both SC and GA.
Marty Prager I am a volunteer for Be The Match/National Marrow Donor Program. They offer on-line videos and video on DVD to introduce patients of various age groups to the process including risks and benefits. Jeremy Smith Marty and Patsy how long did it take from the time your started your SCT before you were out of the hospital and back home? Marty Prager 3 weeks in hospital and the balance of the first 100 days at home as I was very close the the TX center. Kate Hall Ivan had his first transfusion 5 months ago and been near to having his second…Hem told us his organs did not respond well after the first transfusion so wanting to put off another as long as possible….has anyone else had those problems with transfusions? Michael Goldstein Great posts so far. Good to hear of positive responses from several of you. Yes, for some it is a cure, Jeremy with 20 + years of disease free survival. And yes, some have limited GVHD, while others have fulminant acute rejection that leads to demise. And some older patients are receiving it, though it I’d relatively uncommon to have a SCT over 70. Patsy Bushee I was fast reaching the point of needing frequent transfusions, and did have some. I had months to live, and the fibrosis was already at 4, but organs were in good shape. Since transplant, both doctors have told me I would not have lived without transplant until June. Insurance dragged their feet. I had to fight to get them to pay, but they did, and I am getting ready to hold a new grandson. Patsy Bushee I was in the hospital for 36 days, and in a hotel for 3 weeks, near the hospital. Since I only live one and half hours from transplant center I was allowed to go home, and I went back 2 times per week for check ups for awhile. Thank you Penny for your good thoughts and wishes. Marty, so glad you are on here since you helped me! Jeremy Smith Stanford has a very different policy they want to keep you pretty much “locked down” for three to four months at an apartment complex next to the hospital.. Patsy Bushee My doctor will do up to age 70, but I am told some doctors will do up to age 75. Transplant ages the body from 5 to 10 years, but I feel so much better, I feel younger. STC is different for everyone. At my clinic, I know of one individual who is back at work after 6 months. The young man who is half my age, and was in the room next to mine, is in a wheel chair and not doing nearly as well as I, yet my MF was more severe at time of our transplants. Until you plunge in, you do not know how it will be for you. Kate Hall Thank you, I will ask our hem if Ivan’s transfusions were irradiated, I believe they were but I do not believe he received any anti-histamine..Thank you both for that information!! Jeremy Smith My biggest concern is the potential down time I have been warned about. Which is why I have taken the PEG-INFN route. The goal and who knows if it will work, if PEG slows my MF down for ten years a new drug will be out and SCT’s may not be needed anymore. in ten years I would 63 and still able to get an SCT. Jeremy Smith Plus you go through all of this and it might not work. Patsy Bushee The risk with waiting is simply that your organs can be harmed by our disease. As long as you are closely monitored, you should be okay, but you do not want to give up the blessing of a SCT if you are offered one. Sincerely think our grandchildren will have better options, but I do not see them for anyone in the next 20 years. Even the drugs that may offer help with symptoms and possibly slow down disease, seem to often reach a point where they no longer help. For those of us with MF, my warning would be to not wait until a SCT is no longer possible. I have no regrets-period. So worth the risk. I took early retirement. It does work more often now for more patients. Marty Prager Kate: I was given Benedryl which sends me off to la la land usually so transfusions were less of a mental strain. Was also given Tylenol for some reason – probably to fight fever should it occur. Patsy Bushee In fact, at the moment I do not have cancer, and do not expect it to return. I want the same for more of you! Marty Prager I understand your concerns Jeremy. You’re a well informed patient so you’ll know what to do and when. The fact that you have looked into transplant is very important. Knowledge is power. Marty Prager Jeremy: Most of us are not as fortunate as you to have the blessing of time on our side. I was a few months to a year away from dying – NOT from MF but other diseases that come to the forefront when there are insufficient PLTs from the marrow weakened by MF. Jeremy Smith Regarding damage to the body I get it that is why I have changed my diet and am exercising It might not help with thy marrow but according to actual tests there have been fundamental improvements to my my arteries, plaque, as well oxygen in my body. So I am doing everything I can to limit the damage. I have no fatigue so I think you can extend the quality of my life while helpings the meds work. And if none of that works well I will be in great shape for an SCT should that day ever come. Patsy Bushee Jeremy, would never try to get someone to do a SCT when they are not ready. I have already mentioned that I am doing better than some half my age, so if organs are in good shape, age is not as much a factor anymore. I do know from reading things you have written that you started over after leaving a company. You will land on your feet, and you will always be able to have a job you love. You have a wife who wants you around. You just have to take it all in and then make a decision. That is true for all of us. Ann Haehn Genny felt no job or career was more important than life. She’s younger than you, Jeremy, and she’s a single mom. She wants to live for her children. Like Marty said, it’s different for everyone. There’s no right or wrong in this decision. I will say Genny was an exercise hound as well. Exercise did not stave off her MF. Her MF had already morphed into MDS by the time she went to transplant. I am a big believer in not trying to talk anyone into a transplant. I also think people should not talk others out of a transplant. It’s a personal individual decision. Marty Prager I was back at work in 10 months. My mentor, a few years younger than me, was back in 5 months. Kate Hall Patsy, I think that is what scares me the most, that we have wasted so much time…we thought MF was hopeless, just to live everyday which we still do but because of Zhen and this forum we have hope! But at the same time I am angry that our Hem let us live without hope for 4 years, when so much was happening in the MF world….We are so grateful to you all! Patsy Bushee You have found good doctors, so you and they will know when the time is right. Jeremy Smith Agreed Patsy on the Doctors but each Doctor has different opinions. I know I should have over ruled my Doctor at Stanford in 2008 and started the INFN when I had PV but its too late now. The difference for me today is after I receive the input from my Doctors I will be making the final decisions from here on out. Anyway enough about me I am sorry for posting so much. Marty Prager I was on an JAK2 inhibitor for 2 years which gave me the opportunity of a second opinion at a different medical organization. A good friend – also a TX recipient – also received a second opinion. I recommend this as doctors hospitals have different criteria. My friend went with City of Hope as I did because he felt very comfortable with the doctor and the organization’s success rate. He traveled 2000 miles to be treated there. Kate Hall Jeremy, I believe doing things in your life that you love is just as important as any medical treatments, but I am jealous you have a choice! Zhenya Senyak Patsy, Marty… what meds are you taking now… and for who long will they be necessary? Marty Prager Liver toxicity as stated is a big concern. I take gemfibrizol for life. Other meds are sirolimus and cellcept for the current minor but stubborn GVH issue. Most drugs like these for GVH are tapered off slowly when the event is over. I take B-complex and Vit D for kidney health as I was marginal for TX because of kidneys. That’s it. Even with the current GVH issue my quality of life is excellent. Marty Prager The goal is always to be off of all immunosuppresants and I was for a time. Patsy Bushee I still take Acyclovir 2 times per day, 400 mg, and I take Voriconazole, 200mg tab. twice daily, and a third med is Ursodiol, 1 capsule 2 times per day. I have done so well that I only take 2 .5mg capsules of tacrolimus per week. I take Magnesium oxide 400mg Tablets, 4 times per week. Calcium with Vitamin D, 500mg tablets taken 2 times per day. One Nexium tab is taken each morning, and I am finishing a 2 week period of low dose steroids on Wednesday of this coming week. Lost the port about about 4 months ago. In other words, I will soon be off all pills, and this is a dramatic decrease from the pill feast I had to do daily following transplant. Jeremy Smith Can both of you travel pretty much wherever you want to go? Zhenya Senyak @ Marty..what the physical effects of your minor GVH. Kate Hall more important, do you both feel like travelling? getting Ivan to his weekly blood tests is about it for us! Ann Haehn Jeremy Smith – Genny was told not to travel until she hit her one year rebirth anniversary. She traveled for the first time a few weeks ago and she has four trips planned between now and the middle of the year. She did wear a mask on the plane though since this is high flu season. Patsy Bushee We tried travel up to the day I went into the hospital, and it was hard. Swollen spleen, pain, etc.- I was miserable. Took an 8 hour trip to VA, with doctor’s blessings, to spend Christmas with my daughter and her husband, and had a great time. Played in the snow that fell on Christmas Eve and Christma Day! Think I am being held under wraps only because of flu around country, and I have not been able to have injections yet. Marty Prager I am free to do whatever I like. No restrictions related to the TX. Patsy Bushee So anyway, took trip last month by car. That trip was much better than travel before transplant. Marty Prager I have a small mouth sore about 1//4″ x 1/4″ on the gum. I really don’t think it is GVH. It didn’t respond to normal GVH meds and is responding to meds that are used for candida. My dentist made that suggestion and my TX doc said OK to give it a try. No pain whatsoever. If it were GVH there could be some bleeding but there isn’t. Patsy Bushee I have had minor bone and join pain, but most of that has been controlled by low dose steroids taken for just a couple of weeks. Did have a muscle tear in shoulder, probable result of chemo caused weakness, but all in all, I am doing great. Did the twist last night for my hubby! Marty Prager I will need to leave the conversation about 9 PM EST/6 PM EST and will be back in about 90 minutes afterward. Patsy Bushee No video for you, but I am now dancing and singing, and doing laps in my home. Doctor still wants me inside except for doctor appointments, but again, think he is just being super careful because of the flu. I also have to go shortly to return my daughter’s phone call. I would like to tell everyone that if you click photographs at the top of our FB page, you will see pictures of my transplant. Some of the pictures, when clicked will show several. I begged my husband and daughter to take pictures so others on the site would see a successful SCT, and it is all recorded for you there. God Bless! Patsy Bushee Come to think of it, I did have some super dry skin to handle for a few months, but that is no longer a problem. No mouth sores except for time in hospital for a few days, like most SCT patients. I realize how blessed I am because I talk to other patients at the clinics who are getting ready for a SCT, and my doctor sets it up for us. I will try to get back later, but wish you all well. Goodnight. Jeremy Smith Well folks I am home alone with the dogs as Mary jo has taken up to Portland for the Weekend so I must feed them now before I am consumed by them. Wish you all the best. Zhenya Senyak (9PM, Marty you have to go… maybe pick it up tomorrow?) Night Jeremy. What do you think… all, MIchael? TIme to adjourn for the night? Marty Prager Bye for now… Knowledge is power. Life is good. Kate Hall time to move the trotters (harness racing) horses around for their midday break…Thank you to all…G’day from us! Michael Goldstein Thanks to all who offered input and shared experiences. The beauty of an online discussion is that folks can read and respond at any time, though it is also good to have a lively active online discussion in real time too. Patsy Bushee Back to write a final note: Kate-I sincerely wish you the best in your search for answers and the right decisions. Dr. Goldstein-thank you for keeping this going in such a good manner tonight. Can only hope it helps at least one person in the process! Night Zhen-think this idea you had was a good one. Chris Harper Good morning folks (it is here) Sorry i could not be with you last night. I have read the notes and will now chip in my comments. Chris 59 diagnosed with Primary MF Apr 10, SCT Feb 11. UK. Chris Harper Iron levels – I had no transfusions before transplant and lived on HGB between 8 & 9 for the year up to transplant. I had 30 transfusions during and post-transplant and so am so iron loaded 42x normal. I could have played Iron Man in the film with my own costume. Just started monthly donations at Dracula’s castle to get the levels down. I was given one iffy transfusion during transplant after which all had to be matched to a ‘third level down’ at the blood bank from then on. Don’t know the technical details but don’t think it was irradiated. Chris Harper Penny – I didn’t know what to ask as I had no forum like this. I did find a wonderful lady called Judy Cuckston who used to run MPD chat and while I couldn’t get much from the members about transplant other than fear of transplant, ‘don’t do it’ and’ too risky’, I did get brilliant personal support, pointers to research and knowledge of the disease/bloods etc which was very helpful. I posted weekly updates as I went through transplant to share with others. I also met a brilliant MF specialist, and wonderful person, called Dr, now prof, Claire Harrison who helped me along after my local hem decided to just ‘watch me die’ (my words). Chris Harper I was out of hospital on day 17 and home. For the next three months I was at hospital twice a week at clinic for checks, and a third if I needed a transfusion, using private (hospital funded) transport 20 miles in to central London. I was out walking in my garden and then the park in my first week out. However, we were very strict with visitors to avoid risk of infection. Chris Harper I am retired, however, like Jeremy I was stupid about work (no offense Jeremy! ) I worked horrendous hours, was on call 24 x 7,and only missed one day sick in the last 25 years. Suspect I would have been back rapidly with the risk of catching something being the biggest concern. Chris Harper My story is in the MPNforum archives for anyone new. Having an SCT was a no-brainer as I wanted a chance at a longer life than was offered by the potential course of my MF; I was intermediate risk 2 with level 4 scarring. Everyone makes their own decision and I share with the buddies that MPDVoice refer to me, there is no question I will not answer, but I do not say anything to influence their decision. Chris Harper My eldest buddy was 68 but died of an unrelated brain bleed while being reviewed pre-transplant. I have read that doctors do older transplant but underlying health seems to be the key factor. My 68 year old, and a current lady 66 year old were/are both fit people. Chris Harper Patsy – with you on the shoulders, but both! Would have been kayaking from last March but left shoulder bad, now the right! No tears but swollen ligaments, same one in both shoulders. Can do the twist but wouldn’t risk the locomotion, a dance my mum told me about! Also had more leg tendon issues than normal, when running. Chris Harper So that’s all folks, having read that lot you will probably be glad I wasn’t around last night! I am still the MF-BMT tart who will talk to anyone. I only know about this topic from a patient’s perspective and what I have learned online. My way of giving back, some of you call it paying forward, to the wonderful Doctors and nurses, Prof Claire Harrison and the brilliant transplant team at UCH London, is to help others and I have a number of UK and US buddies running at the moment outside of MPNForum. I will talk to anyone and, with my satellite contract, get free calls in the UK and to the US, Oz, and several European countries. I use this to help not just chat. Michael Goldstein Chris, Thanks for your contributions here as well as all you have done to help folks learn about the experience of SCT. Sounds like you have had a great response. You have brought up the issue of the the MF Risk Classification, which is important for those with MF to know about, as classifciation (High, Intermediate, Low) is not only associated with the severity of MF and it’s prognosis, but also response to SCT. Can you share your understanding of the way in which Risk status is assessed? Kathy Dubin Flynn I’m sorry I wasn’t able to contribute last night, so I’ll try to make up for it now. I was diagnosed with post-PV myelofibrosis in October 2010, at age 45 (PV since 1995, when I was 29.) At the 2010 diagnosis, I had a 30 cm spleen, constitutional symptoms like fatigue and night sweats.) I was Intermediate-2. My spleen responded very well to hydroxyurea and shrunk down to the point that it was not visible (I looked about 5 months pregnant at first.) I had a consult at MD Anderson about two months after diagnosis and, like Chris, made a decision fairly quickly that transplant was a no-brainer for me. I have three kids and decided that based on my not very hopeful prognosis, I wanted to go the most aggressive treatment route possible. I felt VERY supported by my MD Anderson team. I had a matched unrelated donor allogeneic transplant on September 27, 2010. I spent 3 1/2 weeks in the hospital and a little over 100 days in a nearby apartment with a parade of volunteer friend/family caregivers. Kathy Dubin Flynn My transplant process went very well. I was extremely fortunate to do well with the chemo (no radiation, just (ha ha, “just”) busulfan, fludarabine, ATG and methotrexate. No infections or complications throughout the process, except that my platelets and hemoglobin took a very long time to come back up, so I had many blood and platelet transfusions and had to keep the central line for five months. Ultimately, my transplant failed and I am back to my own DNA and active disease after brief remission. Most important comment: I would and will be doing it all again. It is well worth it. Kathy Dubin Flynn Currently feeling quite well, oddly, so I always say that transplant somehow bought me improved health and time. Currently on no medications. My white count is high (currently at about 15) but my hemoglobin and platelets are still normal. Spleen is re-enlarging and I struggle at times with fatigue. My doctors agree that I will need another transplant; we’re just riding out my period of feeling pretty good and allowing my body to recover as much as possible from transplant 1. Ann Haehn Genny reads but doesn’t write on social media sites anymore, so you’re stuck with me and my inputs as her primary caregiver. With that, I thought what can I add to this discussion thread that is of any value? Kathy, Chris, Patsy and Marty all have done an outstanding job talking about SCT – the thinking behind having one, the process itself, the dreaded engraftment failure, the life one lives after transplant. We have such a range of experience here. From a 33 year old (Genny) to a 63 year old (Patsy) at time of transplant. Alison is our newbie and Marty is three years post-transplant. Most had the chemo conditioning, Genny had radiation and chemo. Some had single diseases entering transplant; others had co-morbid diseases, as was Gen’s case. One had a sibling match; the rest had a matched unrelated donor. Some transplant experiences have been common to all; some are unique and different. So I thought I would talk instead about the dreaded GVHD monster. The very word, GVHD, scares people – both those considering transplant and those who have gone through transplant. But we said here we would talk about the good, the bad, and the ugly with transplant and chronic GVHD is one of the uglies. Some GVHD is needed and desired – you need it to properly engraft. Chronic GVHD can become a lifelong issue — it can be mildly chronic or acutely chronic (there’s an oxymoron) and can attack the recipients organs when really bad. Well, Gen is one of those who ended up with chronic GVHD. In her case, GVHD has settled into her gut and the suspicion is also that it has settled into her joints (she is still undergoing tests to confirm this). The gut part is fairly mild and with good nutrition is pretty easily managed without any additional meds. Think of someone with IBS (irritable bowel syndrome). It’s rather like that. The joints, however, are another story. Gen has impaired mobility and walks on a cane now. For long distances she must go in a wheelchair. She has developed arthritis as a secondary cause of the GVHD. Her joint GVHD could be significantly reduced with steroids. We know this because Gen has real experience that when on the steroids the joint issues pretty much go away. But Gen hates prednisone and will not go back on it. She is not unlike many on this site – she is not afraid to tell her doctor what she will and will not tolerate, and prednisone is one of those she won’t do (it makes her very wacky and she can’t sleep while on it). So instead, Gen and her doctor are evaluating photopheresis. We know several transplant patients with chronic GVHD who do photopheresis and it has helped them tremendously but it takes a long time before it starts working and you must go to the lab three times a week for several hours each treatment. Gen is willing to invest this time. She tells me the bone pain she lived with from pMF and MDS was much worse than the GVHD of the joints. I remember what she was like before transplant and she’s right. She would cry out in extreme pain from the bone pain. She doesn’t cry out at all with the GVHD of the joints. It’s more annoying than anything. And Genny knows also that she most likely would not be here today without the transplant. So it is all perspective. Some may read this latest development with Genny and say, “Aha! I told you transplant was terrible. You could get chronic GVHD.” Well, transplant isn’t the right option for everyone, and that’s okay. From Gen’s perspective, and that of so many others who have chronic GVHD (whom we know, by the way), the transplant was well worth it. And its proof you can live a quality life, albeit a different one, with chronic GVHD. Kathy Dubin Flynn I think Ann’s point is very, very important. I was initially so pleased not to have any signs of GVHD during the early months of my recovery, but I learned the hard way that they mean it when they say that a little GVHD is desirable. I had none, so also did not have the benefit of the bonus graft vs. leukemia effect that comes with GVHD. Certainly, this is related to my graft failure. I am in an odd spot… my transplant failed, and yet I’m still feeling better than I did prior to transplant. It can be trying to live in this sort of middle ground, but I have become accustomed to appreciating what I have and trying to make the most of it! Michael Goldstein Thanks, Ann for contributing Genny’s experience, particularly with GVHD. Because GVHD occurs in about 50% of SCTs, it is useful for us to hear about Genny’s experience with both GVHD and its treatment. As both you and Kathy point out, GVHD is quite variable, both in terms of intensity (none, minimal, moderate, severe, life-threatening) and where it impacts organs (liver, skin, gut, joints, lungs) it is hard to predict its impact. As Kathy notes, some GVHD may be beneficial. And, there are treatments for GVHD, though these have benefits and downsides as well. As Chris notes, having so much information can be challenging, and may not even be desirable! We all differ in our preferences for having access to data and evidence, as well as preferences for our degree of involvement in decisions. And these preferences may change over time as we develop more experience with illness and treatments. So, I think it is very important for clinicians to repeatedly ask us about our preferences, and even more importantly, respect our decisions! Zhenya Senyak Chris, are your shoulder, ligaments and earlier abdomen issues SCT related? Chris Harper Zhenya Senyak The Jury is out. Abdomen unresolved but when I have minor umbilical surgery in March the surgeon will have a look at what is going on as a side issue. Have queried shoulders and ligaments with my transplant team and was told, maybe! However I was also told by an orthapaedic consultant that shoulder issues of varying degrees affect many in my age group. Michael Goldstein As both Ann and Chris note, sometimes it is hard to know whether symptoms or dysfunction is related to GVHD, medication effects or an unrelated problem.